The world as we know it faces grave danger. An external force from a distant galaxy is poised to plunge through a mysterious space portal and attack the Earth and all who dwell upon it. There’s hope, but also a problem. To save the world, a group of bickering superheroes must put aside their differences long enough to fight a common enemy. That’s pretty much all there is to the story of Marvel’s The Avengers, but an outline of the plot doesn’t say enough about what director Joss Whedon has accomplished with the first mega-movie of summer. To me, it seems as if Whedon hasn’t so much directed a movie as he has organized a teeming and often entertaining cinema onslaught. The Avengers boasts a large cast, a galaxy of terrific special effects, some particularly well used 3-D and enough explosive action to stock an entire summer’s worth of movies. All of this should come as good news to the millions who’ve been waiting for the much-hped movie that unites a variety of Marvel superheroes: Captain America (Chris Evans), The Hulk (Mark Ruffalo), Iron Man (Robert Downey Jr.) and Thor (Chris Hemsworth). This quartet of heroic overachievers receives support from Black Widow, a.k.a. Natalia Romanov (Scarlett Johansson), and Hawkeye (Jeremy Renner). All of these characters are brought together by S.H.I.E.L.D., the secret agency that’s run by Nick Fury (Samuel L. Jackson). So what exactly happens? Well, a lot of noise and clamor as Thor’s evil half brother Loki (Tom Hiddleston) opens a portal that will allow an invading army to conquer the Earth. Fiercely played by Hiddleston, Loki embodies every known political evil: He believes that humans must be — in his words — “freed from freedom.” If humans crave subjugation, Loki’s just the man for the job. Movies such as The Avengers really are elaborate collections of set pieces that have been carefully designed to raise pulse rates. If we’re lucky — as we are here — the action will be assembled with witty flourish. In an early scene, Black Widow dispatches a team of vicious Russian interrogators while tied to a chair. In another high point, The Hulk throws Loki around like a rag doll. The Hulk and Thor bump heads. Iron Man and Thor trade blows. 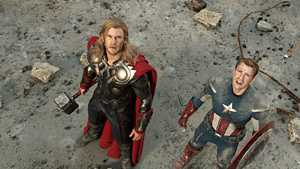 Each superhero’s personality emerges as Whedon zooms through the movie’s 2 1/2-hour length. Captain America’s super-sheld, to cite one example, is matched by his super-sincerity. Downey, an established master of ironic detachment, throws around one-liners as Tony Stark before donning the Iron Man suit that allows him to fly and stave off attackers. If you thought that in a post 9/11 world, you’d never see another movie that ravaged the Manhattan skyline, think again. The movie’s lengthy finale — a more intelligent and imaginative version of the kind of action we’ve seen in the Transformers movies — takes a major bite out of the Big Apple. Look, I know The Avengers is a comic-book fantasy and I know Manhattan hasn’t escaped other movie attacks, but I still have trouble watching New York being destroyed. Call me a wimp if it makes you feel better, but that’s how I see it. There are moments when the superheroes are together in the S.H.I.E.L.D. control room when the pace flags, and Avengers could mark Jackson’s least interesting performance ever. Until now, I’ve never seen him look as if he needed a wake-up call. Of all the superheroes, Iron Man and the Hulk struck me as the most fun, but there obviously are more from which to choose. Enough. I enjoyed The Avengers, but I left the theater entirely unaffected by it. I think that’s because I’m still a bit put off by the idea that this much money and effort has been funneled into comic-book escapism that provides the expected thrills but doesn’t give us much to chew on. But, hey, that’s just me being me. For what it is, The Avengers definitely delivers the comic-book goods, and I suppose we ought to make room in our hearts for commercial movies that pile on excitement intstead of ripping us off.